We accept cash, check or PayPal payments. Payment must be received in full by the start of service. For pet care consisting of more than three full days, we require a minimum 50% down to reserve the date. If your intended care is cancelled, your deposit is fully refundable, minus a 20% cancellation fee. If you have any questions on cost , just let us know! You may also use the PayPal button below to submit payment. 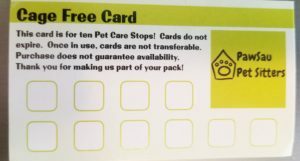 We offer a Pre Paid Pet Stop card option that will save you over 30% on the cost of ten pet stops! Our Cage Free Cards are a business card magnet with ten, 20-30 minute stops. When our Pet Care Specialists arrive at your home, we just mark off a box, and when you get towards the end of the card, we let you know. Simple! These cards don’t expire, and are a great way to secure our service at our current rates. You may gift them, but once they’re in use they’re only valid at one location. The cards are non refundable. A Cage Free Card is $115.00 for 10 Stops. Use the PayPal button below to order yours today, and we will drop it off tomorrow!